A constant influx of pilgrims and messengers to the Jingū meant a large population of employees and guests at the various onshi palaces and ryokan inns that had to be fed day in and day out, especially in Yamada, the Gekū area. 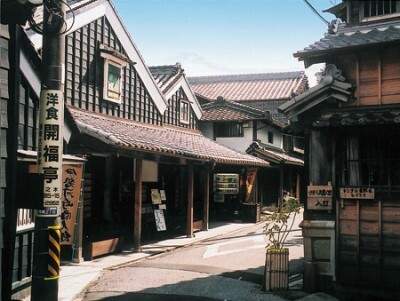 With the rise of the onshi in the 1320s, a workshop and market area opened up in an area called Hatsukaichi (a name that means something like “Sunday Market”, from pre-medieval times). Hatsukaichi served not only the needs of the onshi, but also the Gekū itself, which needed to prepare food offerings for the kami every day. The merchants would sell their food to the Gekū in a building called the Korankan 子良館, which actually doubled as Japan’s first women’s college. Here, women were trained in ritual ceremony, which included the preparation of the sacred offerings. The Korankan was shut down alongside the onshi system in 1871. The amount of work that needed to be done was quickly too much for the confined space of Hatsukaichi, and from the 1400s more serious, large-sale operations began in a separate area called Kawasaki 河崎, which was conveniently located on a river between Yamada and the ocean. By 1620, the crafts and trades in this are were so well-developed that merchants came from China to sell top-quality goods. 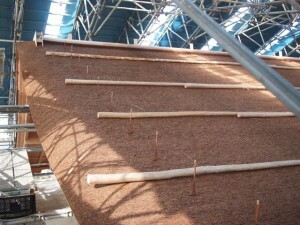 The finished products would be floated down the waterways to the Korankan as well as various onshi estates. A Japanese economic historian summed up this area by saying, “Kawasaki is the throat of Yamada” 「河崎辺ハ山田の咽喉」. For the first few hundred years, business was done using bartering and imported Chinese coins, since the Japanese government was not in a good state to produce its own currency. In the early 1600s, someone in Yamada came up with the idea of paper money, perhaps based on seeing Chinese banknotes. As a result, the Yamada Triad of elders took charge of printing Japan’s first paper money, Yamada Hagaki 山田羽書, which was produced continuously for over 200 years until the Japanese government declared a monopoly on money production, again in 1871. It featured different colors for different values of money, and anti-counterfeiting techniques. Like the onshi records, the Hagaki banknotes are mostly destroyed today, so we don’t know when exactly the system began. Chieda-sensei has spent the better part of a decade hunting down old ones. Pictured below is a one-momme note featuring Ebisu, god of prosperity. Because it relied on business rather than patronage, Kawasaki survived after 1871 and many of its picturesque workshops are still standing, although they are slowly being demolished. The area is now oriented towards tourists and you can buy all sorts of cool antique stuff, rare prints, and old books. If you are looking to take a leisurely walk through Ise this is probably the best neighborhood to do it in. While we learned about and visited a large number of places over the past few days, I’m going to use this post to focus on the subject of onshi 御師. The existence of pilgrimage promoters called onshi had been hinted at in previous classes, and I was under the impression that these people were something like travel agents. This was also the impression of our tour guide for today, who labeled onshi estates as “hotels”. In fact, as the medievalist Okada Noboru 岡田登 explained to us this morning, the name onshi is shorthand for the mind-boggling distance between the ancien régime of 1867 and the New Japan of 1877. Onshi were the literal center of pre-modern worship at Ise, and a key aspect of Japanese feudalism. In an age where the Jingū was closed to everyone but the Emperor, the population of Japan, rich and poor, registered themselves with religious gentry called onshi in order to forward their prayers to Amaterasu. In a word, the onshi were Japan’s First Estate, and Ise was once a sprawling, aristocratic Vatican. I stole this illustration from a corporate magazine called Obayashi Quarterly, I hope they don’t mind. Pictured here is the estate of an onshi named Mikkaichi Dayū Jirō 三日市大夫次郎, which means something like “Joe, Lord Wednesday Market”, certainly not a name I’d associate with nobility. Some of the onshi had strange names; one of them was called Lord Dragon. Mikkaichi Dayū’s parishioners amounted to 350,000 to 500,000 households, meaning that he likely had over a million people on his rolls who exchanged their “first rice” fees (初稲料 hatsuhoryō) for the right to have prayers forwarded to the Jingū, and the possibility of staying at his estate and witnessing a kagura sacred dance if they were ever able to save up the money for a pilgrimage. Here’s the shocking thing; the kagura dance was not performed at the Jingū itself, but was in a special building towards the back of this estate. 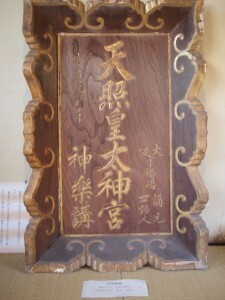 Furthermore, the ofuda talismans that onshi sold to parishioners were not from the Jingū, but were produced completely by the onshi, in their capacity as shrine priests. In short, the onshi were religious institutions providing the public’s sole line of access to the Jingū. 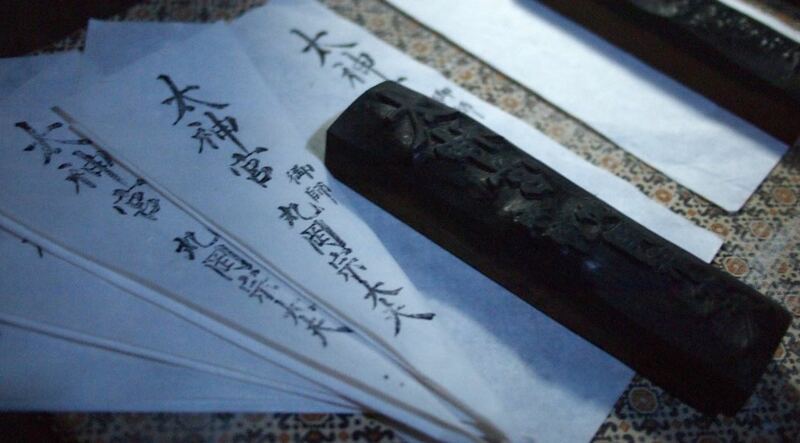 Pictured: The original stamp used by a Gekū onshi to produce ofuda, along with several examples. 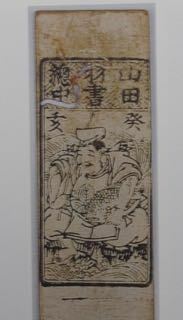 The sticks that one finds inside ofuda would also have been supplied in-house. Okada-sensei painted a rather dire portrait of the state of knowledge we have about onshi. He expounded at length on the fact that nothing was saved when the onshi system was abruptly abolished in 1869. A system that had received the support of 80-90% of the Japanese population suddenly vanished, and all the gorgeous estates had no means of upkeep. Like the suddenly disinherited samurai Shiba Ryōtarō describes in Clouds Above the Hill, the onshi had no choice but to move away and find new jobs, but where samurai families had houses scattered across the country, everything the onshi had done was centralized in Ise, which instantly transformed from the noble headquarters of an established religion to a backwater fishing village. Hundreds of years of detailed records, detailing up to 700 years of Shinto customs, were generally sold to paper mills where they were turned into tissues and toilet paper. In many cases we do not know how onshi families came into existence or how they became chosen by their patrons. Many of the abandoned onshi estates were turned into rubble when the Americans bombed Ise in 1945, and others were demolished in the postwar years due to their extreme age. In 2015 there is only a single onshi estate still standing in Ise. This is the Estate of Maruoka Sō Dayū 丸岡宗大夫邸, which happens to have been built in 1866. 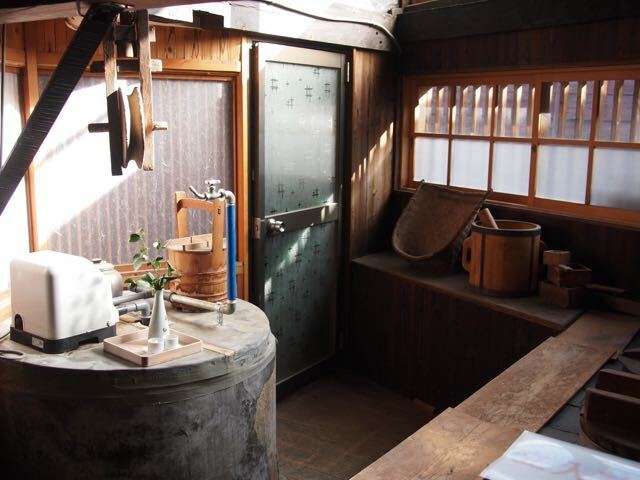 It is currently owned by the 18th Maruoka Dayū, Maruoka Masayuki 丸岡正之, who works as a carpenter. Maruoka receives no money from the city or prefecture to pay for upkeep on the estate. He does not make enough money to keep it open, but has spent many years keeping it intact and opens it up for special occasions, such as when a group of foreigners are visiting. He says that his grandparents loved the old house very much and preserved it when many other houses were left to rot. Pictured: Micchan stepping into a front room. As I said, the onshi system lasted almost 700 years. (General Electric and Disney will be quite lucky to last that long.) It began as a replacement for the Saiō, when the Saikū was falling into disrepair and the Imperial household was no longer able to provide the Jingū with reliable funding. In 1181, Minamoto no Yoritomo, the founder of the shogunate system, came to Ise personally and petitioned a 4th rank Gekū priest (konnegi 権禰宜) named Watarai Mitsuchika 度会光親 to make a prayer on his behalf. It was the first time in the Jingū’s 700- to 1100-year history that a prayer was offered on behalf of someone other than the emperor, and it was the first time someone from outside the Imperial family had come to Ise for that purpose. As far as legitimizing his authority went, Minamoto no Yoritomo was both bold and clever. He was also a trendsetter. 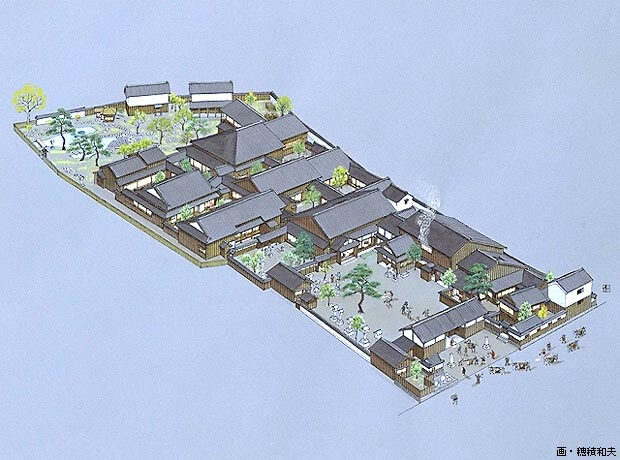 As more estates in Japan fell into private hands, leading to the feudal or manor system (荘園 shōen), emerging landlords dedicated portions of their land to the Jingū specifically, in order to get the same divine favor that Minamoto had secured. This land was called mikuriya 御園 “sacred manors” or mizono 御厨 “sacred kitchens,” i.e., places where offerings were prepared. Similar to the medieval Church, the Jingū ended up inheriting and possessing large amounts of land in this way. The Gekū priests who made prayers in exchange for these offerings were called on’inorishi 御祈祷師, or “sacred prayer teachers,” later shortened to onshi. A similar system was already in place at Kumano, and later many shrines and Buddhist temples had such teachers, usually called oshi outside of Ise. 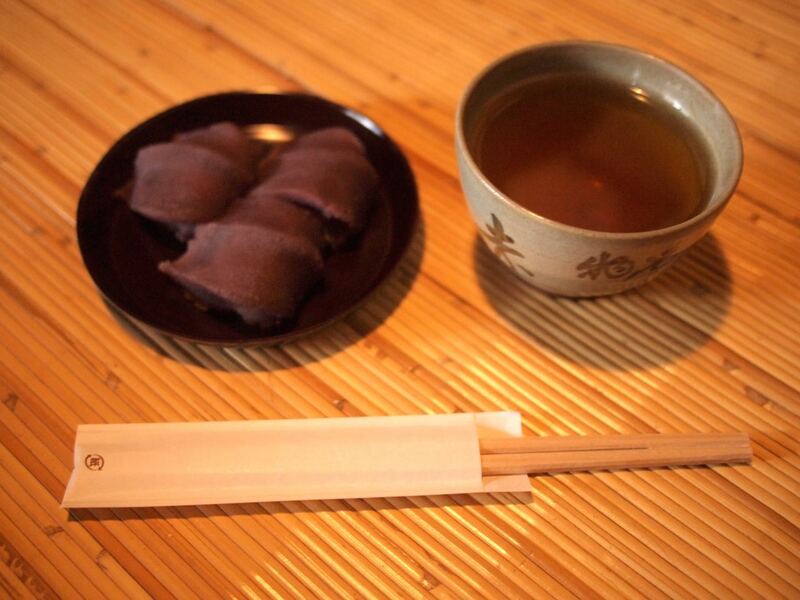 By 1383, the Ise onshi were serving parishioners in every part of the country, from Ezo (Hokkaido) to Kyushu. The onshi multiplied into the hundreds and they began purchasing parishes from each other and fighting over patrons. As we learned way back on day 1, the communities they supported, called Yamada and Uji, were basically at war with each other from 1400 to 1600, causing the only interruption of the shikinen sengū in Japanese history. Three classes of people served as onshi. First came the officiating priests called konnegi, who were usually called Dayū 大夫 after their aristocratic rank and often called ji’nin 神人 or “god people” in written documents. Lower level religious functionaries, also able to offer prayers, were called shin’yakujin 神役人. Finally, ordinary merchants, through some intervention that Okada-sensei did not describe, were able to become onshi at some point; perhaps this was how we got to Lord Wednesday Market above. [edit: Chieda-sensei clarified that the merchants, including Maruoka Dayū, purchased their titles.] All levels of onshi had to employ bureaucrats fluent in all the different dialects of pre-modern Japanese, in order to grant prayers and do business with people from across the country. Uji-Yamada was at last pacified, and the onshi system officially regulated, with the rebirth of the shogunate in the 1590s, and the system reached its peak in the 18th century. Every onshi was at the head of an enormous nationwide network that had its luxurious headquarters in the sacred city of Ise but went all the way down to itinerant travelers bestowing ofuda as they did their rounds in rural villages, and selling goods such as astrological calendars from Ise or beauty products (usually made from mercury… oops). As noted above, up to 90% of Japan’s 30 million people were members of an onshi group in some way or another; those with no membership at all were considered in a vague way to be outside the reach of civilization. In 1724, the Gekū peaked at 615 different onshi lords, and in 1777, the Naikū had a much smaller peak with 271 onshi. Following this, the groups slowly consolidated their power. The Maruoka Dayū estate that we visited today contained rare surviving testaments to this power. 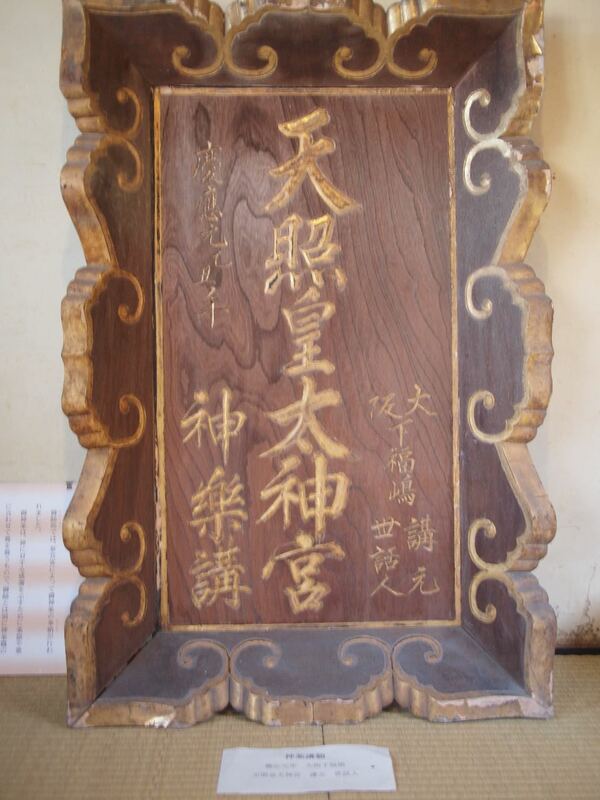 First, we have this hengaku 扁額, produced to memorialize a kagura dance conducted by the onshi and his parishioners in 1865. It looks like a pretty ordinary engraving on wood… but when our tour guide Chieda-sensei saw it, he remarked, “pretty bold!” Why is it pretty bold? Because it reads “Great Jingū of Amaterasu Ōmikami” 天照皇太神宮, but in fact, this onshi was serving the Gekū, which honors Toyouke Ōmikami, god of agriculture and food preparation, and most certainly not Amaterasu. The ofuda stamps at the Maruoka Dayū estate seem to testify that as the Amaterasu cult picked up steam in the mid-1800s, the onshi around the Gekū simply began proclaiming that they were authorized to offer prayers to Amaterasu. But this is something it’s impossible to know for sure, because so many records were destroyed. Now, some more proofs of power. Next to the ofuda is a very long list of people who gave money to the onshi in honor of the shikinen sengū (the money did not pay for the sengū itself, but apparently they simply solicited every time this happened). 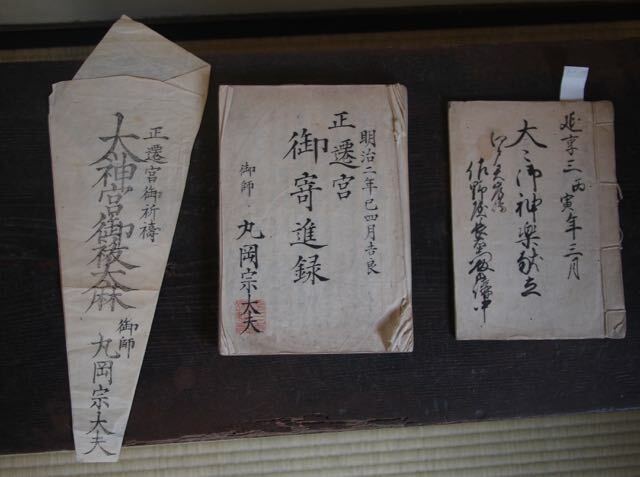 On the right is the reward provided to parishioners who came to Ise: a travel schedule for a deluxe package pilgrimage, with three days of meals and events surrounding the kagura dance. This may look like gross profiteering from a modern perspective, but in fact this onshi was performing a sacred duty for his parishioners. He was their link to the Jingū, as they were not allowed inside themselves. Only after the abolishment of the onshi system in 1871 were the gates opened and a kagura hall built inside the Jingū itself. By the way, if you go to Ise to see a kagura today, you will see it performed by beautiful young women. But the dance you would have seen at an onshi estate up until 1871 would have used older women, often in their 50s and 60s, with decades of practice. Ten luxurious gates of a style reserved for titled gentry are scattered here and there in the city of Ise, along with a few beautiful antique rooms comprising the partial remains of the Maruoka Dayū estate, and that is all that remains of the onshi system that once ruled this city. Once, Maruoka Dayū boasted a nationwide network, but now his heritage is hanging by a thread; the building seems ready to collapse, and the government will not pitch in for this last testament to 700 years of history. The friends of the owner have set up a Facebook page to encourage people to preserve the estate, and that’s about it. Today I will be making an intensely specialized post about a lecture I heard today from Professor Shirayama Yoshitarō 白山芳太郎先生. If you are reading this via RSS you may want to skip this post. It’s for my own records or something. After a brief pro forma exchange of documents with the Office of Shrine Affairs within the Enryaku-ji, the Tendai temple that until the promulgation of these orders had administered the shrine, Juge and his band of self-proclaimed “restorationists” (fukkosha) proceeded to remove every statue, bell, sutra, tapestry, scroll, and article of clothing that could even be remotely linked to Buddhism from the shrine complex. All inflammable materials were gathered together and burned; all metals were confiscated to be refashioned into cannon or coin; stone statues were decapitated and buried or thrown into the nearby river; and wooden statues were used for target practice, or their heads for impromptu games of kickball, and then burned. That’s from Of Heretics and Martyrs in Meiji Japan, page 9. (ISIS would be proud!) Ketelaar’s narrative reads this as Shinto ideologues destroying Buddhist cultural heritage. But Shirayama-sensei reads it as political ideologues– essentially, Confucian nativists– wrecking and burning a Shinto shrine. Probably Shinto does not qualify as religion; therefore it lacks a center of moral guidance, and is merely the reverence of Heaven. This essay was reprinted in a magazine with much wider readership, whose nativist readers complained that Kume was generalizing the unique regalia of the Emperor and got him fired from his university post. But here’s the very odd thing: legally speaking, Shinto was not supposed to be religion at this time, but was officially declared the common customs of all Japanese people. Shrines were barred from performing funerals, shrine priests were not allowed to preach, etc. So it is unclear who Kume was arguing against. Yamazaki Minako 山崎渾子 has spoken of this episode as one requiring further rethinking. In fact the majority of intellectuals at the time shared Kume’s basic sentiment. He was fired only for stating it publicly. The proof of this is once again in the irrefutable statistic that the enlightened intellectual elites of Meiji discouraged shrine work to an extent never seen before in Japanese history, and demolished half of the shrines in the entire country. In the Edo period, Shinto really was a religion, or a tradition/teaching, to use the contemporary terminology. It was described in Edo intellectual literature as one of the “three teachings” 三教 of Japan, and it had its own rituals, specialists, schools and texts. In the Edo period, shrine priests refused to do business with Buddhists and conducted their own funerals. So, Kume’s argument was actually doing the work of the state in denying the Edo period narrative; he simply rewrote the argument the Meiji state was making in an overly frank way. Where Shirayama-sensei’s theory gets confusing itself is when he tries to tie in Western scholars: Chamberlain, Aston, and D.C. Holtom were all said to be similarly demeaning to Shinto. Like Kume, Holtom wrote that “what may be called an inner sense of religion is unfortunately conspicuously absent” in writings about Shinto. But Kume’s ultimate objective was the same as the government’s: to preserve Shinto in a “restored,” “primitive” form as an instinct for reverence for the Emperor. Holtom’s objective was quite opposite to this: he saw Shinto as having some kind of religious seed which, if properly nurtured, would mature into something like Protestantism. I outlined this in detail back in 2010. Maybe the conquering will of the gods overpowered those who wanted to seek out principle, and now all we have are the embers of something the whole world once saw burning bright. 1. I went to the library and established to my own satisfaction where the Uhō-Dōji 雨宝童子 statue came from. 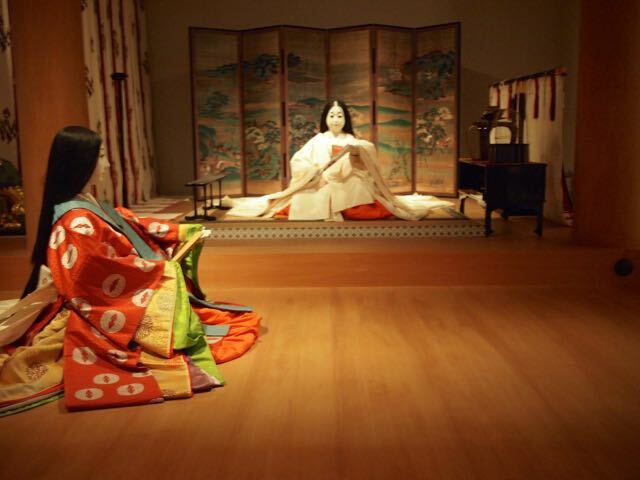 The statue is a late Heian forgery attributed to Kūkai. It’s associated with a document called 「雨宝童子啓白」, also attributed to Kūkai, that claims that the statue portrays the incarnation of most of the ancient Shinto gods, including Amaterasu. 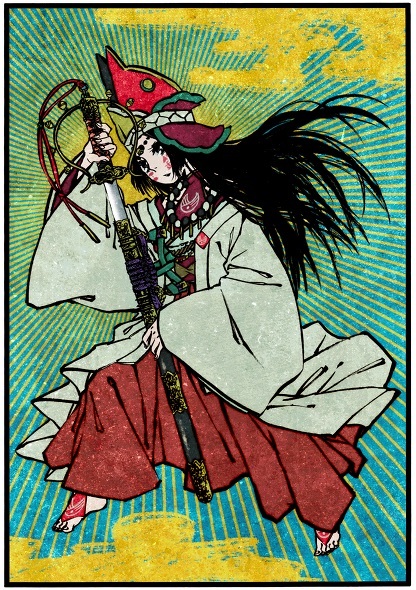 Later, this portrayal was associated with Amaterasu specifically, which is the connection that became prevalent in the early Edo period. More details about this can be found in an abstract I translated, below the picture of fried chicken. 2. I had lunch with a random stranger who chatted me up in English outside a restaurant. He told me about the Three Great Soul Foods of Ise, which are legendary with the local people. 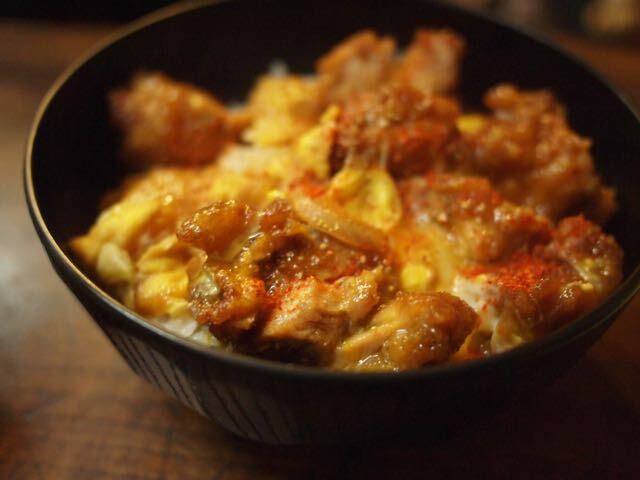 They are the Spaghetti of Mori Cafe, the Dry Curry of Kitchen Cook, and, pictured below, the Fried Chicken Bowl of Manpuku Diner. In present day depictions such as publications, Amaterasu Omikami is generally drawn as having hair that hangs down richly, plain dress (generally white), a chest adorned with jewels, and a mirror in her hand. But originally, Japanese kami were not depicted in this way, and when we trace depictions of Amaterasu Omikami back through the ages, from the descriptions in the 記紀 [as well as supplementary Heian materials] we can guess at a female form, then in the Heian period a theory of male form appeared, while according to 本地垂迹説 she was given a Buddhist image, and in the early modern period images of 雨宝童子 became popular. Any and all of these forms, though, while they may have changed slightly, continued to exist until the beginning of Meiji. Out of all of these, the 雨宝童子 image, which became widely known through the efforts of the prevalent pilgrimage site 金剛証寺 near the Jingu, bears a 5-layer pagoda on her head, a pearl ball in her left hand, and a treasure-pole in her right hand. With the passing of the ages we begin to see the treasure-pole as a sword, and the ball as a mirror, and jewels adorning her chest. This is in accordance with better knowledge of the mythology, and can be seen as the beginning of the solidificaion of people’s images of Amaterasu Omikami. According to the influence of this 雨宝童子, we images of the gods wearing [specific kinds of ancient Chinese dress] become common. The image later being reimagined as a hatless and white-clad form, we may be said to have arrived at the present day. As I’ve noted in a previous post, at one point there was only a single pilgrim allowed to visit Ise; a female relative of the emperor called the Saiō 斎王. Today we visited the Saiō’s classical period palace, called the Saikū 斎宮. At the Saikū history museum we watched a video about how a young girl would made the long and arduous trek from the Heian court in Kyoto to this remote palace a day’s walk from Ise. (Nobody knows why the Saikū is so far from the Jingū.) The princess had to maintain royal dignity even far from the city, so she was carried the entire way in a palanquin, including a hike over the mountains. Once they arrived at the Saikū, they had to obey the directional taboos and wait for a lucky day to enter. The Saiō would stay in her palace for about five to eight years, then she would be carried back. About 800 years later, ever-literal moderns did a close archaeological survey to figure out what the palace once looked like, and rebuilt it and swept the rubbish from its grounds. 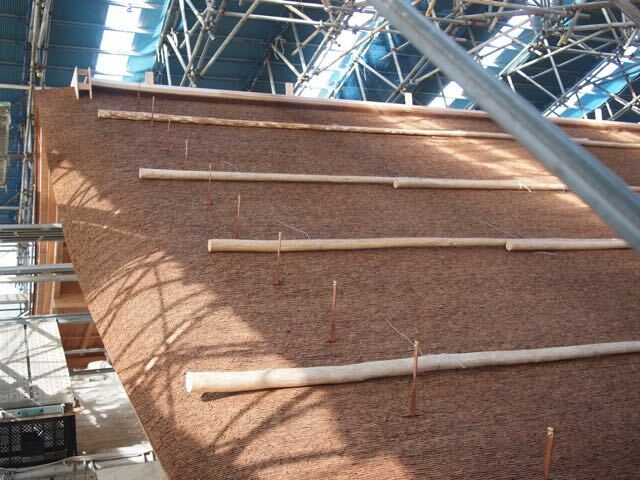 This year, three more buildings will be constructed, placing new wooden pillars precisely where the old ones used to be. 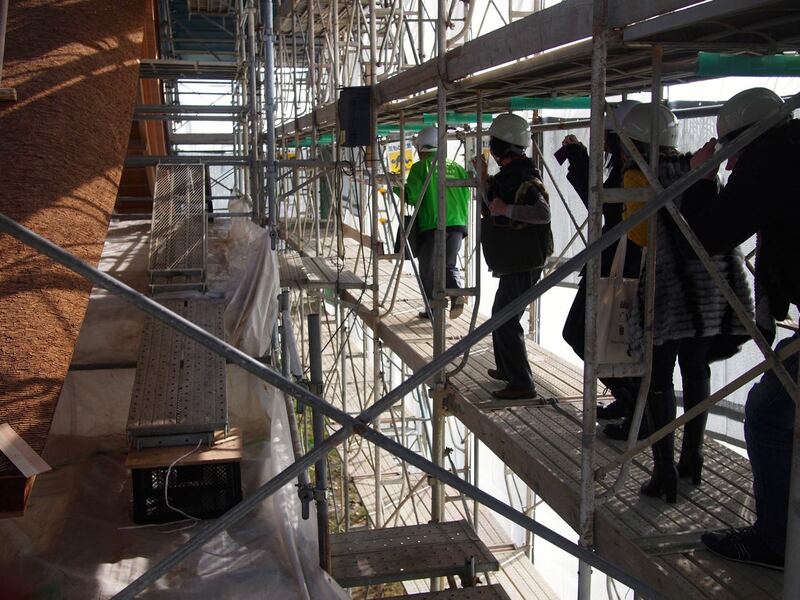 We were given a surprise tour of the construction site, which was a surprise to those among us who were wearing high heels. There’s already both a museum devoted to this complex, and a “history experience hall” in the completed rebuilt building. So this new building will be a space for events, such as the national karuta competition, or traditional arts like Noh plays. The village where the Saikū was once located is otherwise known for farming. When I was there I saw a farmer driving a tractor down one of the ancient stone paths that the Saiō would have taken to get to Ise. There is very much a countryside feel to this place. 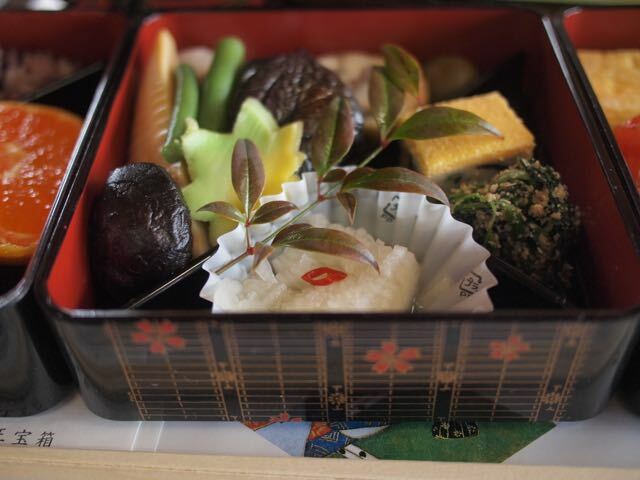 If you ever get the chance to visit the Saikū, make sure to go to the little cafeteria across from the “history experience hall”, where you can enjoy a palanquin-shaped bento made entirely of local foods. 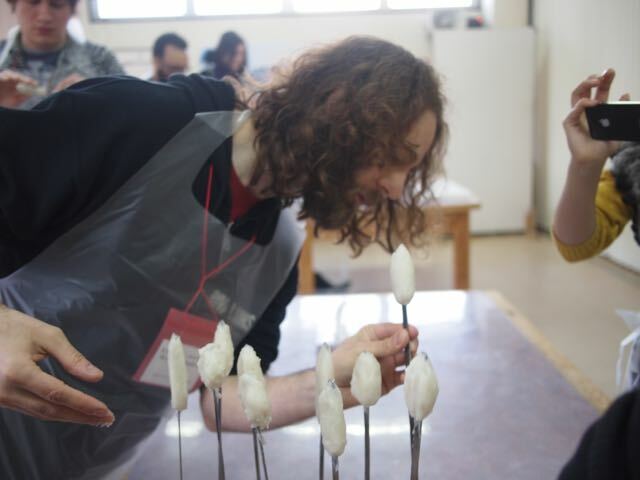 The other thing we did today was go to the fish paste (kamaboko) factory and make some fish paste cakes, but I don’t have any good pictures of that. Wait, I lied! 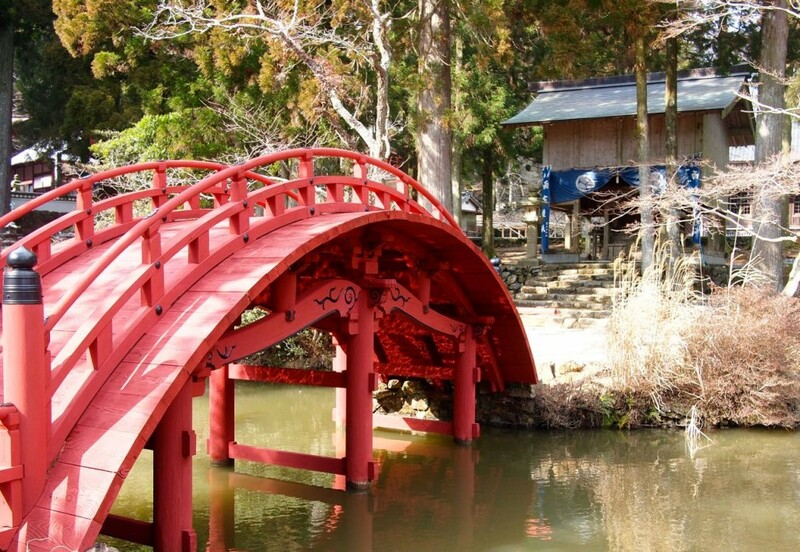 Today, Ise Jingū is known exclusively for being a place of Shinto pilgrimage. But up until the Meiji separation of shrines and temples, there was a place you could walk to from the Naikū for another kind of pilgrimage. I once tried to walk from the Naikū across the mountains and found it a rather intense experience. I wish I had known that if I had taken a different direction, there would have been a Buddhist temple complex called Asamayama waiting for me at the end of the trail. The bus ride to Asamayama took us on a narrow, bumpy road up a steep mountain for about half an hour. As we reached the top there was nothing but wilderness visible in every direction. Our first stop was the treasure house, which had the word CLOSED 閉館 painted on it in large letters using tape. The head priest unlocked the doors and showed us inside; there were some 1000-year-old national treasures, which properly belonged on the altars of the various buildings, kept in the treasure house due to the recent spree of robberies by Korean nationalists. There were also various medieval curios, such as an old set of weights and a artfully carved statue of some warrior Buddha wearing elephant heads for his trousers. As I was taking the above picture of the entrance, the head priest pointed the other way, down a very old-looking stone path, clearly of prewar construction. There was a weathered sign reading “Old Pilgrimage Road” towards its start. “This goes all the way to the Naikū,” he said. I wanted to run down and take a picture of where it went, but we were hurrying along to the main Buddha hall. Pictured: a bridge we weren’t allowed to cross. Asamayama possibly dates back to the 6th century A.D., making it almost as old as the Jingū itself. Here, the aristocrats could go into seclusion as monks and nuns; in the early 20th century a metal canister was discovered with a sutra in it, written by a nun in honor of her dead husband, a chief priest at the Gekū. At this temple, Shinto and Buddhism are mixed freely. A sakaki tree stands in the main Buddha hall, and behind the enshrined Buddha there is a hidden altar to Amaterasu. Formerly, Amaterasu herself was honored in one of the temple buildings, using a statue of her 16-year-old self, called Uhou-Douji 雨宝童子 or “Rain Treasure Child,” and supposedly carved by the genius philosopher Kūkai. This statue is now kept in the treasure house. I would like to know why the sun goddess was given the name “rain treasure,” and why the specific age of the figure portrayed was so important. (Update: Mystery solved) Here is a completely unrelated picture. Away from the main Buddha hall, in a secluded part of the mountain, is another building where the monks presumably live. Connecting the main buildings with these side buildings is a path covered in many rows of calligraphy painted onto wooden poles, called sotoba 卒塔婆. This word is quite simply the Sanskrit stūpa स्तूप imported into Japanese through Chinese. The stupas are left to honor the spirits of the dead and help them achieve Buddhahood. The bigger the pole, the more expensive. Many of these poles are the result of a monthly offering by Ise’s fishermen to calm the souls of the fish they catch (below, left). But the largest one of all, a special offering (below, right), was for the soul of the grandmother of the owner of Akafuku, who made the sweet rice cakes we ate outside the Naikū. 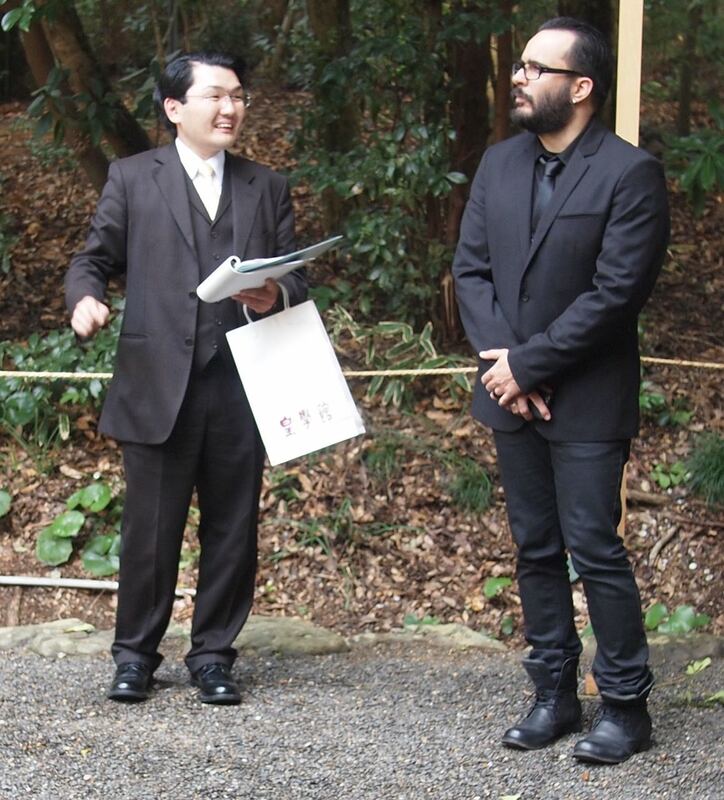 We have also learned on this trip that Akafuku’s owner has promised over $1 million to build a soccer stadium at Ise. I never knew that rice cakes could be such big business. The past two days have been focused on two things: a guided tour of Ise Jingū, and an overview of Ise society focusing on the early modern period. Our professor for these two days, Sakurai Haruo, introduced us to a lot of fascinating things about life around the Jingū in the early modern period. Ise was Japan’s biggest attraction, home to the country’s first paper money, first environmental protection policy, community libraries, souvenirs, and coupon books. 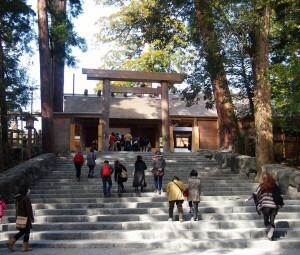 Originally, Ise only had one pilgrim: the saioh 斎王, a female Imperial relative who lived in a house called the saikū 斎宮. As the ages passed, eventually other kinds of attendants were allowed in, then Buddhists, then the general public. By the Edo period, Ise was being marketed throughout the country by professional promoters called oshi 御師, which means “great teacher,” but tellingly is a homonym for “pusher” [this is incorrect. For details see this post]. Ise became big as a place to get away to. Sakurai-sensei showed us a memorial to a teahouse in Osaka where people would gather to form groups and start on the road to Ise. In fact, it was not just those from out of town but also those in Osaka who would gather here, in order to get away from their families before starting the trip. 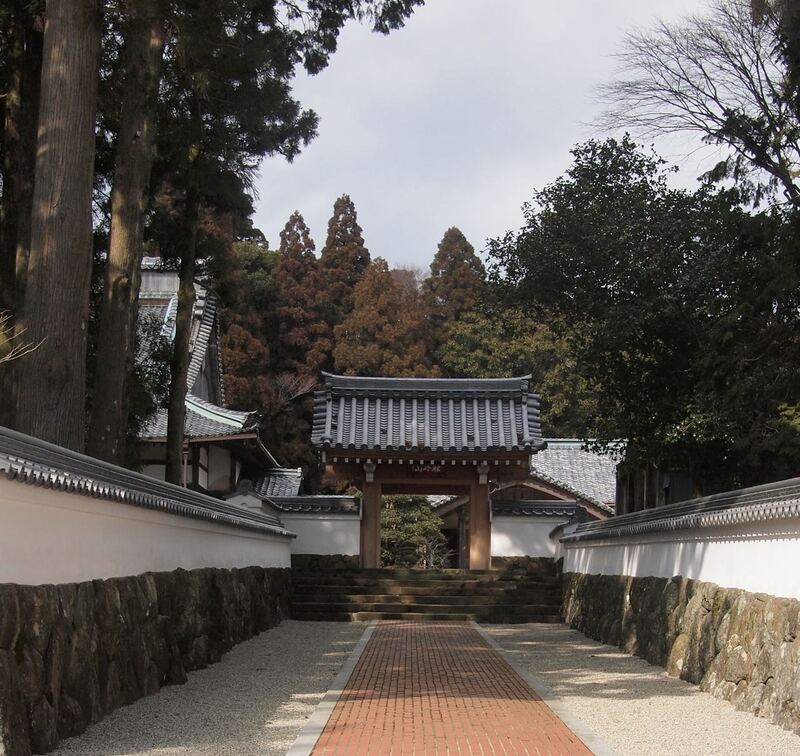 In the Edo period, apparently, people from all walks of life desired a break from the everyday, and trying to improve their lives and connect with the heart of the nation at the Jingū was the popular way to achieve this. Runaways were often punished, but this was rarely severe. It seems to be akin to the modern day situation of a teenager grabbing Mom’s car and going for a joyride, except that in this case the runaways could claim they had important reasons to go to the Jingū, and could take a month or two to return. The attitude of shrinekeepers towards the pilgrims and the trials they expected them to face on return is worth noting, as translated in an excellent article by Laura Nenzi in the Japanese J of Religious Studies. Collected by members of the Ise clergy (hence the reference to recanting the faith in the Lotus Sutra), these tales inevitably end with the triumph of the kami and of religious logic, effectively serving as propaganda for the claim that faith ought to exist above and beyond the practical needs and the laws of “this” world, and would have its ways in the end. But notice also the concern the Jingū shrinekeepers had for a lowly servant. Such a class of person could not be expected to bring a financial windfall to the Jingū. What concerned them more than economic benefits was ensuring that trips to Ise would be taken seriously and respected as an act of devotion. Pilgrims carried a ladle to show that they were accepting donations, but for unknown reasons they would discard it when they reached the Naikū. Mothers often came carrying their children, and if they were separated, the monks of Ise would take care of the kids until they were reunited. It was a crowded place, especially in years of okagemairi when millions of people suddenly descended on Ise en masse, and rarely would visitors stay for more than 2 or 3 days. But they might go on to some other, less sacred destination before returning home. 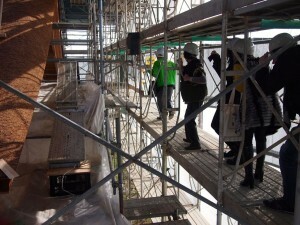 Our tour was led over the past two days by Sano-san, who I posted a picture of on Day 1. He gave us all the stats on every major shrine inside the Jingū grounds. The guy really is a walking database. As always, Kogakkan paid for the tour and gave us free Akafuku, the famous Ise treat. I hadn’t had it before and it was delicious! Today, visitors to Ise get an even more splendid sight than the pilgrims of the Edo period: streets full of well-maintained, beautiful old houses, called Oharai-machi around the Naikū and Iseshiekimae around the Gekū. The restoration of these streets, which took place respectively around the 1993 and 2013 shikinen sengū, cost the city over $400 million. But the attention to detail shows, for example when you look at this unusual convenience store entrance. These days, though, the Japanese approach to religion is changing. After the Aum Shinrikyo subway bombings especially, many Japanese people feel “allergic” to religious adherence, but they still want a connection to an unseen “something” outside themselves. As a result, pilgrimage to Ise has skyrocketed, and random spots inside the shrine are now becoming “power spots” where people try to feel some magical energy radiating out. Sakurai-sensei said there has not been a lot of work done in this field yet, but this is something I hope to look into during my own research program in Tokyo. Today we focused on traditional rites, shrine workers, and seasonal festivals and events. Much of what we learned can be summed up in a rare video we watched called The Heart of the Matsuri: an Invitation to Shinto. This video seems to be fairly little known even among Westerners interested in Shinto, as it only has about 10 views on YouTube. But it is quite informative so I will put it right at the top of my post. Please go ahead and watch the whole thing; I’ll be here when you get back. Besides being a fascinating collection of real festival videos, this video shows an idealized picture of how Shinto ought to work according to Jinja Honcho, which organizes most of the shrines in the country. 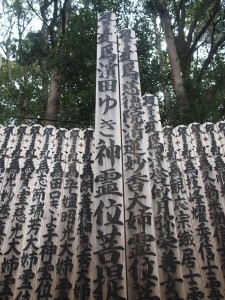 Of particular note is their emphasis on the ujiko system, in which people take care of shrines to which they have a blood connection — shrines connected with their historical or legendary ancestors. Because there are only 20,000 shrine workers in Japan for 80,000 shrines, Jinja Honcho likes the volunteer work done by ujiko. 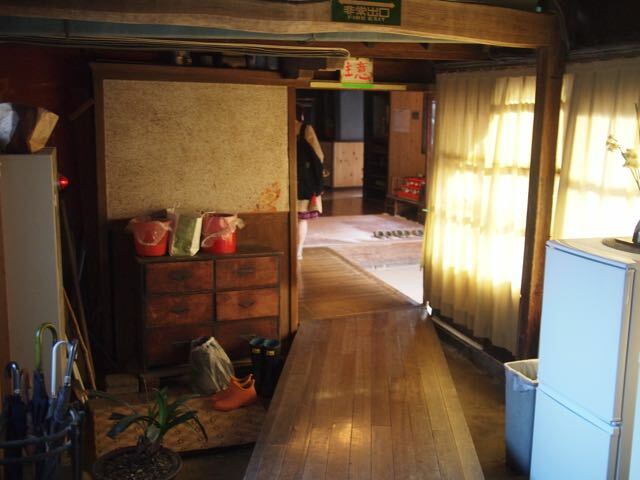 But in fact, despite how it is described in the video, many Japanese people are not aware of being connected with an ujigami, especially when they have moved away from their home villages. Because the professor-priest who showed us this video was clearly involved in Jinja Honcho, I was curious and asked him what Jinja Honcho recommended for when people move from the countryside to Tokyo. 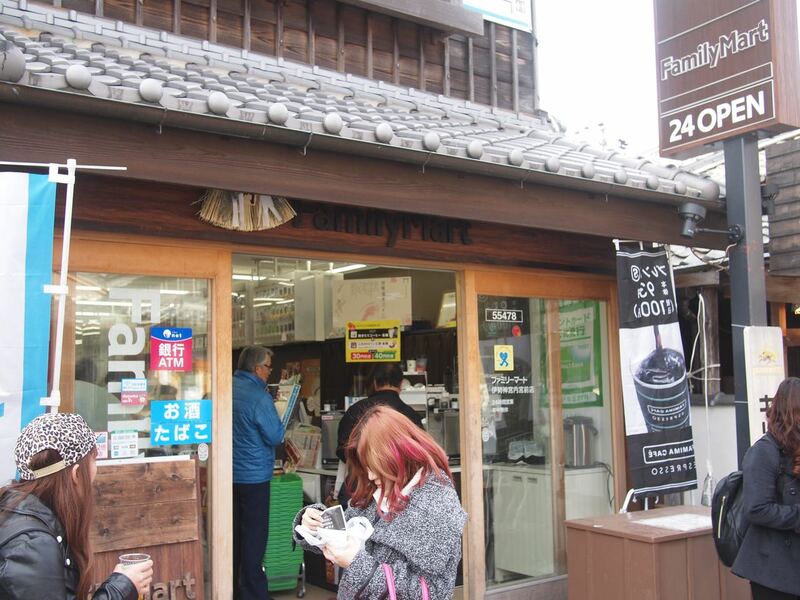 He said that even if they have no uji in the area, they still have ubusuna 産土, the particular neighborhood they live in that ties them to a local kami. But he did not seem to think it plausible that people would seek out a local association to become ubuko, 産子. 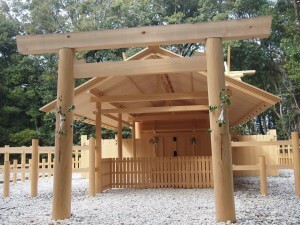 He said that this is something they would have to learn about by talking with local people, and so he concluded that regrettably it would be hard for urbanites to remain in this idealized Jinja Honcho system if they don’t work to create social ties binding them to their local community, kizuna 絆. This video was from roughly 1998. 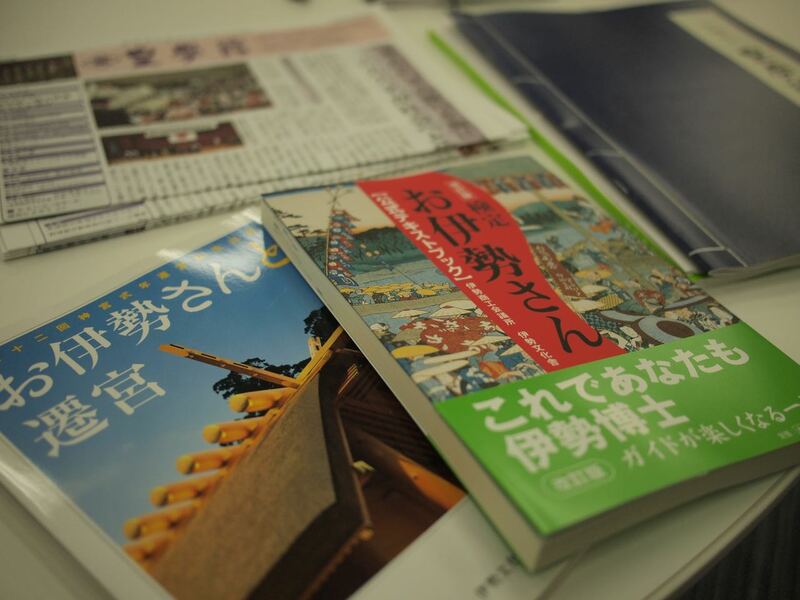 We also received another, much more recent attempt to introduce Shinto to foreigners: the book Soul of Japan, produced to commemorate the 2013 shikinen sengū. This book made some headlines in the Japanese press for the fact that words like jinja and kami were officially decided to be left untranslated. However, it is only offered as a PDF and a pamphlet available in Ise itself, and you can’t really order a copy online. Other things we did today included learning all of the annual rituals performed at the Jingū, hearing about the history of the Jingū, talking about Ise’s attempts to promote itself to foreign tourists, and dressing up in the outfit worn by shrine workers (神職) of various kinds during the most elaborate ceremonies. 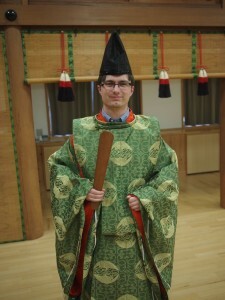 Here’s an embarrassing photo of myself in full shrine regalia. It was interesting to experience wearing this kind of clothing for myself. It took about half an hour to put on, and we were instructed to handle ourselves carefully when we were walking around with it on, but once I took it off I had the distinct feeling that my Western clothing was informal and slovenly, a feeling that was shared by many of my classmates. Here’s a photo of some of my classmates being instructed in the way of doing full ritual sanpai for women. 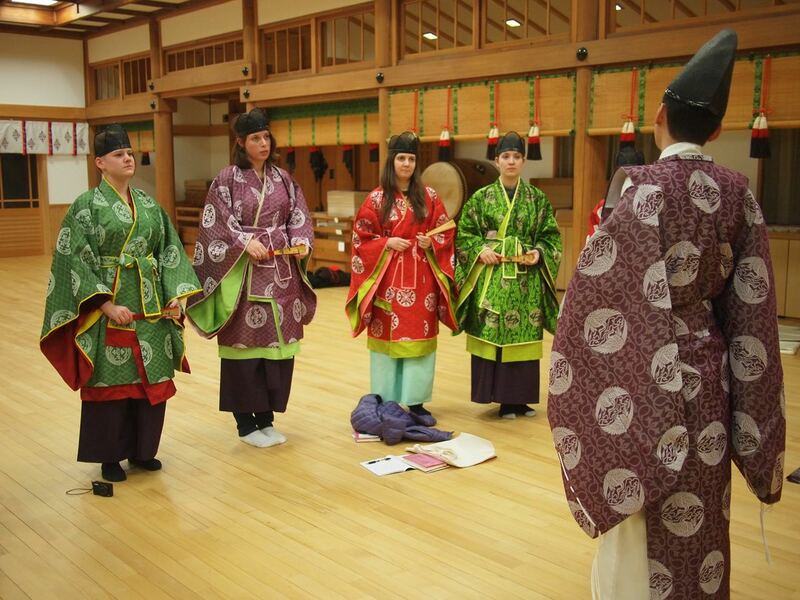 We learned how to walk and move gracefully in a space used for practicing shrine rituals. The professor-priest showed us the difference between the worship area (拝殿 haiden) of the shrine, where people ascend a staircase and pay their respects, and the main hall (本殿 honden), which is open only to priests. 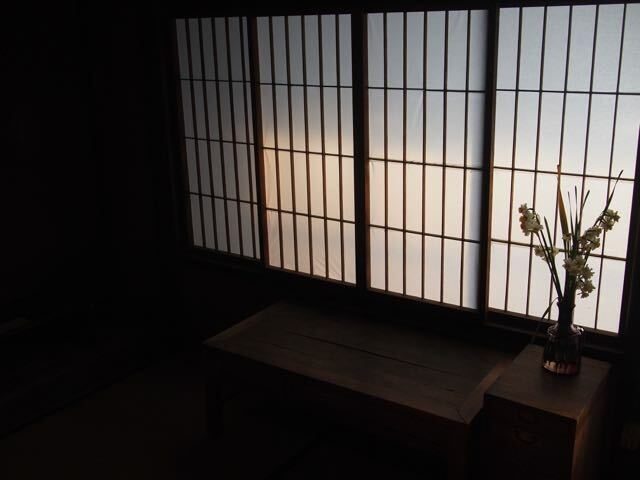 When he raised the curtain and allowed us to enter the practice honden, everyone piled in and had a look around. Of course, there were no secrets there, just a table used for making offerings. 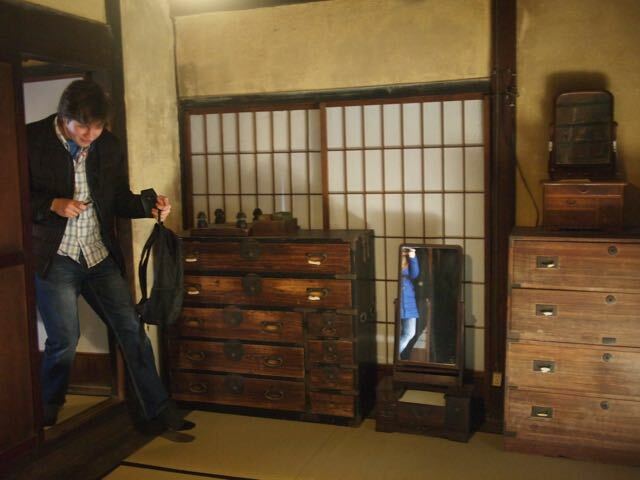 The actual object representing the enshrined kami (神体 shintai) would be behind another, closed, door, which is visible in the background in this photo. It is interesting to consider a great difference between Western and Japanese instincts in this regard. I think many Westerners get unreasonably curious about what can be found in secret places. We all want to get a peek behind the curtain. 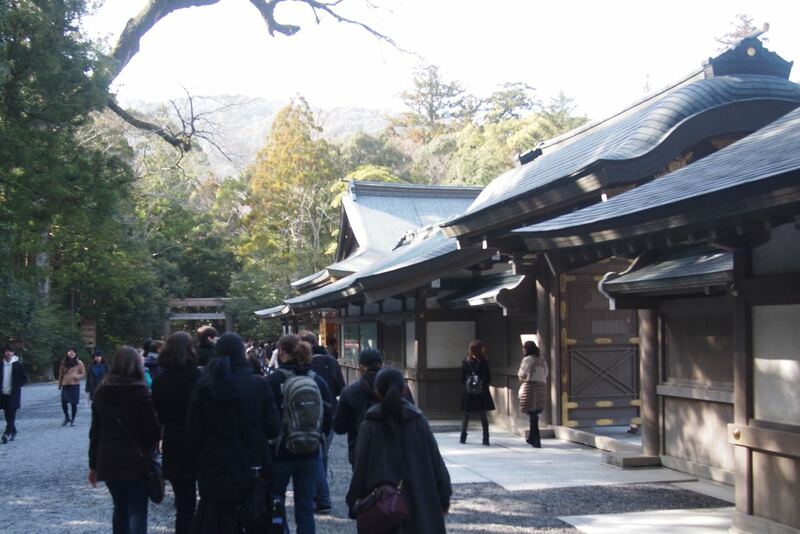 But at Ise Jingu, thousands of Japanese every day content themselves with praying to the curtain. It only costs $10 to get a special sanpai and get yourself a little closer to the honden, but very few Japanese people are interested in this. After all, the important thing is that the kami is there, not the kind of mirror or object it resides in. Kōgakkan University is a small private college in a city in rural Japan called Ise, home of the most important Shinto shrine, Ise Jingū. 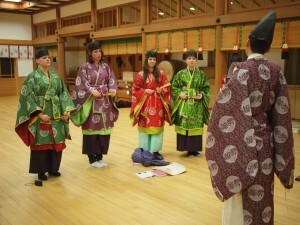 This month, I join other masters’ students on a Shinto studies program at Kōgakkan. We’ll be touring all over the city and surrounding countryside, hearing lectures in Japanese from some notable scholars in the fields of Japanese history and religion. I will be sharing much of what I see and hear, so this blog will have more updates than usual. 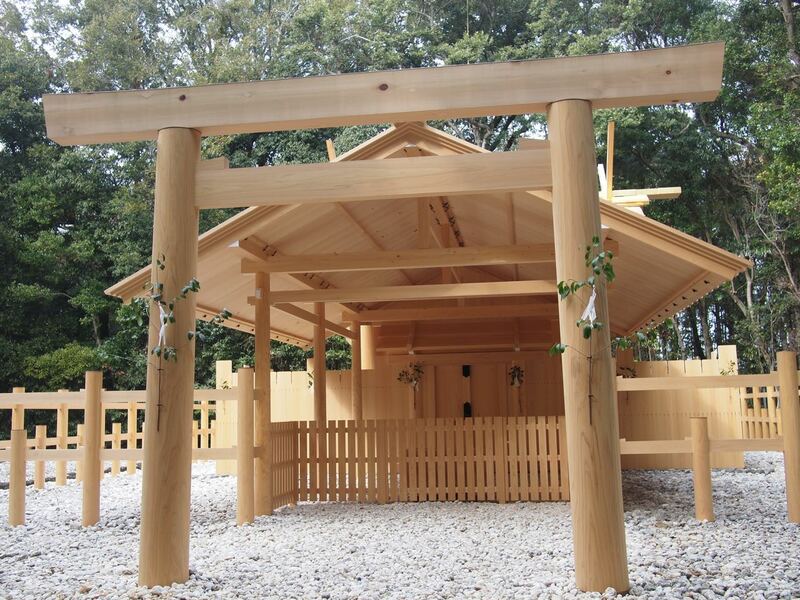 There are thousands of Shinto shrines across Japan, but there is only one Jingū. The Jingū is where the most ancient figures of the Imperial line are worshiped. 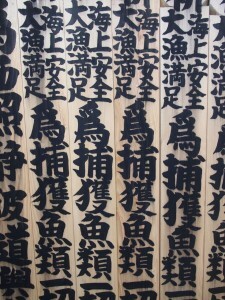 The kanji for Jingū 神宮 is “kami + miya”, where a miya implies something like an Imperial palace. If a shrine (jinja) implies a dilapidated old altar on the side of the road, a palace (miya) is a new building, regularly rebuilt to prevent decay, that can only built on Imperial grounds. Indeed, ordinary citizens are not allowed inside the central building, or honden 本殿 of the Jingū. We must stand at the outermost gate. Only the Emperor and his family are permitted to enter. Ise Jingū consists of two different legal organizations, the Gekū (外宮 “Outer Miya”) and the Naikū (内宮 “Inner Miya”). The Naikū is also known as Kōtai Jingū, or the Emperor’s Jingū. The most important kami at the Jingū is Amaterasu-Oomikami, who is housed in the central miya of the Naikū. The Gekū houses Toyouke-Oomikami, who was called to Ise to prepare Amaterasu’s food. As is common across all ancient societies, the offering of food to the highest ancestor is a very serious matter: in this case, so serious that part of the Jingū is dedicated to the kami who would prepare that food. Kōgakkan, located between the Naikū and the Gekū, is one of only two universities in Japan that has the promotion of Shinto as its founding mission. Shrine priests are also trained here. This means that some unusual groups are coming through; today in the Kōgakkan lunchroom, there were a bunch of young men dressed in shrine priest robes who sang a Shinto prayer before and after eating. I am sure that I will see and learn many more interesting things in the days to come. After the opening ceremony today, we heard a lecture from the president of the college, a Shinto historian named Shimizu Kiyoshi 清水潔. Shimizu-sensei explained that Kōgakkan was founded in 1887 as a reaction to Tokyo University having no Eastern readings in its original curriculum. To give us a taste of the early Meiji love of all things Western, he related the episode of the Rokumeikan, where Japanese nobles built a modern dance hall and attempted to hold fancy dress parties in a perfect copy of European fashions, only to trigger harsh critique from Westerners who found the empty imitation of their social rituals uncomfortable and eerie. Japan had a need to blaze its own trail and assert itself as a developed country, without endlessly imitating Europe. Shimizu-sensei quoted from German archaeologist Heinrich Schliemann’s 1865 account of his visit to Japan. Schliemann was apparently impressed with Japan’s mastery of Western technologies, but felt that Japan lacked “spiritual development” — that is to say, Christianity. In this context, the philology and classical studies promoted at Kōgakkan could be helpful to Japan in demonstrating its moral worth as a nation. 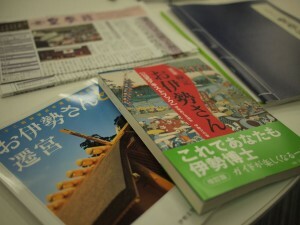 Shimizu-sensei is of the opinion that even today, Japanese people need a firm grounding in their own language and history in order to explain their culture to foreigners. Shimizu-sensei discussed briefly how Kōgakkan was closed in 1945. He only briefly mentioned that the primary reason for the closure is that the town of Ise was razed to the ground by American bombing. This began with, in January 1945, the destruction of several Gekū buildings, and continued into the summer with severe damage to Kōgakkan. The school did not reopen until 1962, with the support of alumni who had become wealthy in the postwar years. No longer would it be a public Shinto institute; now it was a private college, which has focused increasingly on education in recent years. Sir Arthur Toynbee visited the Jingū in 1967. He left a message for the people of Ise where he described his experience at the Jingū as affirming the “underlying unity of all religions.” Shimizu-sensei apparently found this phrase very moving and he repeated it several times. Maybe he should read Frithjof Schuon. Yamatohime-no-miya was just renewed for the 2013 shikinen sengū, a recurring 20-year event where all of the shrine buildings at the Jingū are torn down and rebuilt. 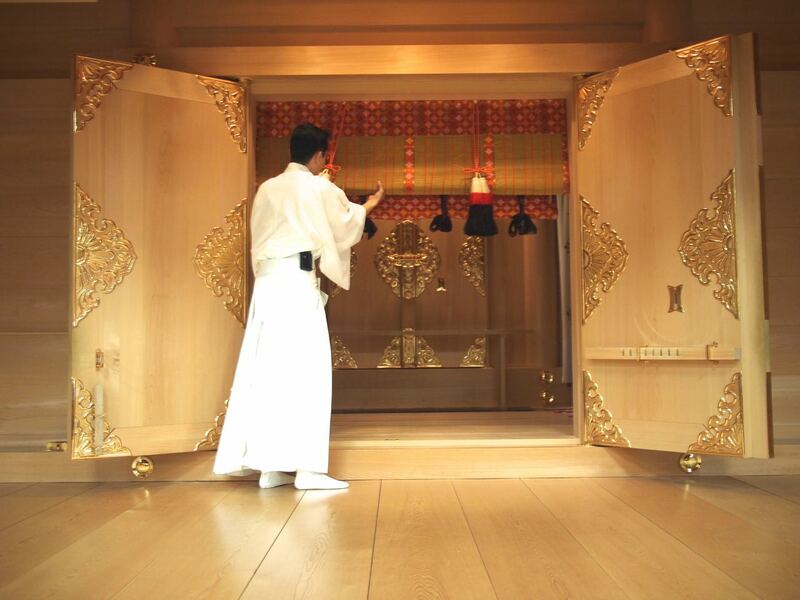 As Shimizu-sensei reminded us, the shikinen sengū has been going on for over 1300 years. Our otaku guide, Sano-san, gave us some very complex and technical information about the circumstances surrounding Yamatohime-no-miya’s founding (it’s actually a new shrine) and its ranking in the internal Jingū shrine system (it’s called a betsugū). Following this, we had two lectures on the history of Ise from Okano Tomohiko 岡野友彦, a medievalist with a specialty in reading premodern Japanese literature. By this point my hike had worn me out, but I was awake enough to understand the important point that for much of its history before the 20th century Ise was dominated by two alliances, the Yamada Triad and the Uji Assembly, which controlled the pilgrimage businesses around the Geku and Naiku, respectively. He described a 1486 event where the Yamada refused to allow visitors to pass to the Naiku, which caused the Uji in return to call upon a neighboring warlord, Kitabatake Masasato, to give the Yamada an ultimatum. When they ignored him, Kitabatake and his crew set fire to the entire Gekū pilgrimage area and murdered the Yamadas indiscriminately. Some of the Yamadas were murdered inside the Gekū, which caused it to fall into a state of impurity. Okano-sensei did not mention this, but the Yamada and Uji actually called the Kitabatake warlords to intervene in their disputes (i.e. help kill each other) about ten times from 1400 to 1600, something which should have pleased the Kitabatakes very much, as it allowed them to build their power base in the Jingū area. It is not surprising in this context that the only time in history that the shikinen sengū was interrupted was the period from 1460 to 1580. The shrinekeepers must have been remarkably impoverished at this time. After the Meiji Restoration, Ise Jingū took on renewed importance, and by 1930, with the expansion of the imperial cult, there were plans to turn it into a sacred city, similar to how the Saudis have attempted to renew Mecca. In 1940, the 2600th anniversary of Japan’s founding, a plan was approved to completely remodel the area. But in a typically shortsighted way for the time, the people who signed off on this plan did not realize that Japan’s increasing disregard for Western interests had set it on a path to total war. Okano-sensei described the postwar atmosphere at Ise, in an era when the Jingū had been bombed and damaged and the Kōgakkan abandoned, as a “hard blow spiritually” 精神的痛手. But the Jingū was rebuilt with private funds and continues to conduct the shikinen sengū today, with increasing interest from the Japanese public. Over the course of 2013, 13 million pilgrims came to see it happen. Another thing we learned from Okano-sensei is that it always rains on or near the day of the Naiku sengū. After class we had a welcome party where I tried and failed to strike up a conversation with my professors, and then we students enjoyed a nijikai (second party) with all the extra beer and liquor left behind from the party. Okay, that’s it for today! Here is a guide to Bay Area culture, by and for East Coasters. All of these articles are really good.